Squarepop—public squares of refusal—is the broken madness of the world stood on its head. 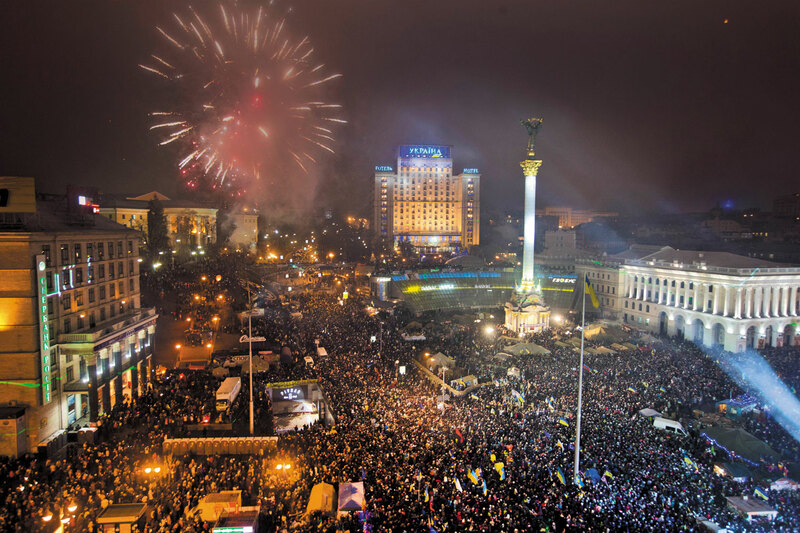 Squarepop: Pro-EU protesters celebrate the New Year in Kiev’s Maidan, January 1, 2014. When we speak of “pop,” we often speak of an instance or, more likely, a set of similar instances that seem to elucidate the character of a given moment (that would be the “circumstance” part). Two examples is a coincidence; three, a zeitgeist. What if we ignore instances altogether, at least for the moment? Pop exists, after all, independent of specific cases. It’s the 100-minute film narratively structured like a suspension bridge, or it’s the three-minute song. The forms can be filled time after time with infinitely varied contents. But the song remains the same: verse, chorus, bridge, chorus. It keeps working. The shape is the pop. Every now and then, however, a new shape materializes, or an old shape suddenly seems able to hold the mercurial soul of an era, to give coherence to the hour’s charisma. In the last few years, a shape has stepped forth onto the world stage with precisely this capacity, a form that asks us to recognize it as popular culture while revising the category. I speak, naturally, of the square. Zuccotti Park is likely the best known, but there is no shortage of celebrated candidates—the Acampada Sol (Madrid), Oscar Grant Plaza (Oakland), Syntagma (Athens), Tahrir (Cairo), Taksim (Istanbul)—that can serve as examples for the defining political feature of our time, mass phenomena repeated and repeatable, shifting from city to city, continent to continent. Astute commentators point to Tiananmen Square in 1989 as precursor, and reasonably so. People have gathered in squares to express political sentiment since the dawn of geometry; nonetheless, there is nothing as tiresome as nothing-new-under-the-sun-ism. If the political pop of the square has a history, what doesn’t? But pop forms claim their moments precisely by seeming timeless, by suddenly suiting their own circumstances so well as to appear natural. The brilliant student movement in Quebec, more often in the streets than the camp, nonetheless drafted the red square as its symbol. It was 2012; nothing else would do. The square now seems like the most natural form for refusal, resistance and revolt. This is not a development that content can explain—not quite, at least. If Occupy directed itself against banks, corruption and corporate power, urban squares were filled as well with calls to honor the Constitution, to abolish the Constitution, to go back to the Keynesian compromise, to go forward to some unimaginable future. No few were also neo-Hoovervilles. Internationally, the grievances were even more varied, ranging from the specifics of a transit fare hike in Brazil to the Arab Spring’s “The people want the regime to fall”—a maximalist slogan with a perverse fate, to say the least. Ask for the general, and the general you shall receive. Still, the contents of squarepop are not perfectly fluid. Pop songs can be about anything, hypothetically, but it turns out they congeal into the same few themes over and over again: love, new beginnings, the desire for an exceptional life or the satisfactions of the ordinary (two sides of a single coin). A basic question of pop culture must be whether the form of the pop song compels this content, or if it’s perhaps the reverse: Is verse-chorus-bridge-chorus the way that such content can best say itself? The relating of these dimensions is the gold standard of all thinking about pop; it does not forsake us now. If there are insistent contents coursing through the squares, two carry the most weight: the sense that the nation has betrayed its commitment to guarantee equitable access to the good life, and unemployment. This perhaps gets us near to the secret of the square. For the aforementioned pair are strangely mismatched. The dream of steady employment and a decent wage has become a nightmare of precariousness and displacement; if this has hollowed out the hope of the good life, it is odd to demand reparations from the government. But the economy is not something on which one can make demands, exactly. True, you can join your colleagues in a workplace strike—if you have a job. Scratch that one. Led by their lack of some other shared life, into the plazas go the immiserated and the indignant, the plazas so often placed before the Parliament or City Hall, and so unfailingly ringed by the police, the state in its period-style work clothes. That is to say, it is exactly the hollowing-out of work that makes the square a necessary political form; it is precisely the character of the square that compels a confrontation with the state, which could not answer the underlying needs even if it wanted to. This may go toward explaining why the latest movements of the squares take on an increasingly nationalist aspect: Ukraine’s Euro-Maidan (literally, “Euro-Square”) movement, and the struggles leaping from plaza to plaza in Bosnia and Herzegovina. Surely these, with their competing and dangerous nationalisms, demonstrate the square’s great capacity to organize contemporary politics. But they also underscore the way in which the politics of the square, to seem sensible, must imagine that the state can solve every problem, and so must increasingly imagine a stronger state. This is a delusion, but one that comes from real conditions. So we have come full circle. The seemingly natural form of our age’s politics is also the most unnatural. Far from being seamless and inevitable, it arises from contradiction and desperation. Perhaps we should admit that this is true of songs and movies too, and the rest of pop culture: that, beyond being the pleasures and pacifications with which we are familiar, their smooth consistency is the broken madness of the world stood on its head. Every perfect pop song wants a riot.